Americans are drowning in auto loan debt. A new report from the California Public Interest Research Group, or Cal-PIRG, finds the average car loan has increased 75 percent over the last decade. In all, Americans owe more than $1.2 trillion in auto loans. 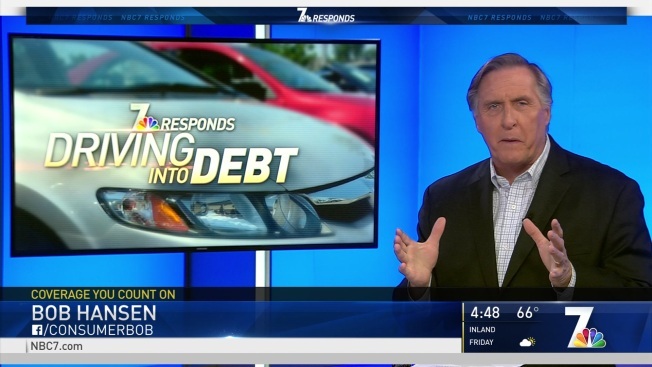 Rusch told NBC 7 Responds there are several reasons for the rise in auto debt. Those include inadequate levels of mass transit, as well as predatory lenders who are more concerned with closing the deal than anything else. “Loans are given to those that probably can’t afford them, and in many cases won’t be able to repay them,” added Rusch. So, what should consumers do to make sure they don’t go underwater on their car loans? Rusch suggests to do research before going to the dealership. Banks and credit unions will provide quotes on interest rates and will pre-approve car loans over the phone or at the branch. Also, Rusch told NBC 7 Responds that saying no to some of the expensive add-ons such as extended warranties and other items will also keep your payment down. In addition, Rusch said always reject the offers to lengthen the length of the car loan, even if car payments would be more. Not everyone agrees with PIRG’s findings.